Two astronauts ventured outside the International Space Station early Thursday and performed what amounted to hand transplant surgery on the lab's Canadian-built robot arm, removing a crippled grapple fixture on one end of the arm and replacing it with an on-board spare. Floating in the Quest airlock, station commander Randy Bresnik and flight engineer Mark Vande Hei switched their spacesuits to battery power at 8:05 a.m. EDT (GMT-4) to officially kick off U.S. EVA-44, the first of three excursions planned over the next two weeks to service the Canadarm 2 space crane and carry out a variety of maintenance work. "It's more gorgeous and heavenly than I saw when I was out here eight years ago," Bresnik, a spacewalk veteran, marveled as he floated out of the airlock 250 miles above Africa. "Good morning Egypt!" A few moments later, Vande Hei, making his first spacewalk, made his way outside. "And Houston, that might have been one small step for a man, but one giant leap for Sabot," Bresnik said, using Vande Hei's nickname. "Congratulations, my friend, on becoming the 221st human to exit in your own personal spacecraft into the void of space." "Appreciate those words," Vande Hei replied. "Happy to be doing this with you." The primary goal of the spacewalk was to replace latching end effector A, or LEE-A, one of two grappling mechanisms on the station's Canadian-built robot arm. One LEE typically is used to anchor the arm at various attachment points on the lab complex while the LEE at the other end is used to lock onto and move visiting spacecraft or other large components. The arm also relays power, data and video to and from attached payloads. "The LEE is the mechanism, the set of mechanisms, that does all the heavy lifting, it does all the mechanical attachment when the arm walks end over end and establishes a new base point, when it picks up our robot DEXTRE to go do station maintenance or when it catches and releases free-flying cargo vehicles," said Tim Braithwaite, the Canadian Space Agency's station liaison. The Canadarm 2 measures 57.7 feet long, weighs nearly 4,000 pounds, has seven joints and, in the weightless environment of low-Earth orbit, can move large spacecraft and modules from one point to another. The LEEs feature internal snares that rotate and tighten to lock onto grapple fixtures while latches engage to supply power, data and additional rigidity. Each LEE is a "very complex package," Braithwaite said. "There are a lot of mechanisms, lots of on-board avionics, a camera, a force-and-moment sensor, it may be one of the most complex electro-mechanical packages that we've flown in space." The two identical LEE mechanisms allow the arm to move inchworm fashion from one mounting point to another on the station's exterior. The arm also can mount itself atop a mobile transporter that runs on rails along the front side of the station's solar power truss to move the arm to various work sites. In recent years, telemetry has indicated age-related degradation in the latching end effectors. "Since these components are well beyond their design life, this really is expected wear and tear on the arm," Braithwaite said. "It's been manifesting itself partly as increased motor currents in the mechanisms on board, and particularly the latches." On Aug. 22, flight controllers at the Johnson Space Center in Houston were attempting to reposition the arm when the LEE-A latches failed to fully extend. "We actually had the latches stall during that operation, which is quite unusual," Braithwaite said. "We took a really good look at all the data ... and basically, that LEE-A latch mechanism is telling us that it's time (for repairs)." With the robot arm positioned between them, Bresnik and Vande Hei first removed insulation and then loosened six bolts holding LEE-A in place so it could be removed and temporarily mounted on a cart attached to the arm's mobile transporter. The astronauts then removed an operational LEE that was mounted on the transporter itself and bolted it in place on the end of the arm, tightening the six bolts and re-attaching the insulation. The faulty LEE, which eventually will be returned to Earth for repairs, was repositioned on the mobile transporter. During one or more spacewalks early next year, the arm's LEE-B grappler will be removed and replaced with a spare currently mounted on an external storage platform. Another fight-ready spare is available for launch as needed. Bresnik and Vande Hei completed the LEE-A replacement work well ahead of schedule and were able to carry out two so-called "get-ahead" tasks before returning to the airlock. "We've had a very, very good day," astronaut Mike Hopkins radioed from mission control in Houston, telling the spacewalkers to wrap things up and call it a day. "Thanks for all the work that went into developing the plan," Vande Hei replied. Bresnik then quipped: "You came out on your first EVA, Sabot, and you saved the arm." Airlock repressurization began at 3 p.m., closing out a six-hour 55-minute spacewalk. 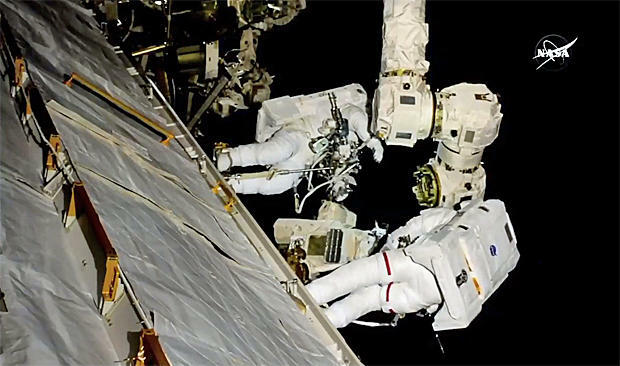 Two more spacewalks are planned Oct. 10, with Bresnik and Vande Hei, and 18, with Bresnik and Joe Acaba, to lubricate the newly attached LEE-A fitting, to replace two cameras with degraded color and to carry out other routine maintenance. Thursday's spacewalk was the 203rd EVA devoted to station assembly and maintenance since construction began in 1998, the eighth so far this year, the third for Bresnik and the first for Vande Hei. All told, 127 astronauts and cosmonauts representing 10 nations have now logged 1,265 hours and 10 minutes of station EVA time, or 52.7 days.